What's a pan-European word for "disturbing filmmaker"? Michael Haneke is my best guess. The 75-year-old Austrian maestro of malfeasance makes those younger provocateurs like Lars von Trier and Yorgimos Lanthimos look like pikers. 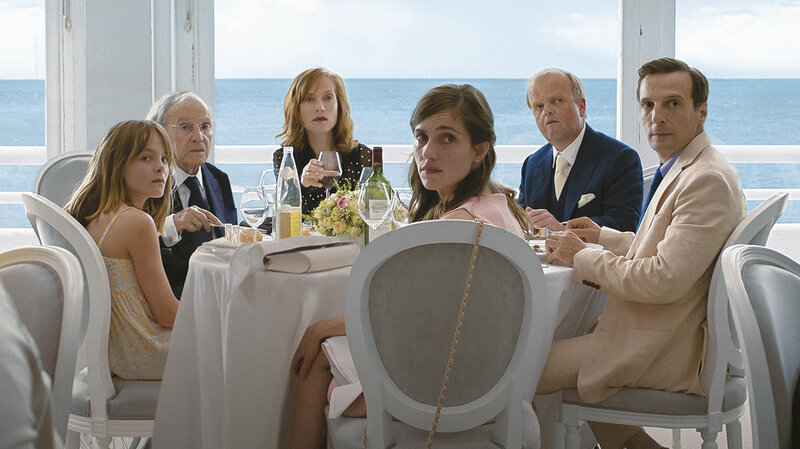 Happy End, Haneke's first film in seven years, after his Academy-Award winning Amour, is more of a career consolidation than a step forward for the 75-year-old director. Offered in the usual impeccable framing and emotional distance, it's a cold satire of a loveless European family, which culminates in a perverse alliance between a sociopathic child and a suicide-fixated old man. Happy End opens in the narrow rectangular frame of a child's Iphone video. She is secretly watching a woman preparing for bed, while a child expresses her hatred for her in text form to someone else. Later, the same child videos herself drugging her pet hampster. We finally meet the budding auteur, Eve Laurent (Fantine Harduin), after her mother is hospitalized with a drug overdose. A solemn girl, two months shy of her 13th birthday, Eve is sent to live with her father and his new family. The dad, Thomas (Mathieu Kassovitz) and his new family live in a sprawling family mansion in the French port city of Calais. Thomas' sister and the family matriarch is the icy Anna (Isabelle Huppert) who is planning a second marriage to an Englishman (Toby Jones). He’s both her fiancé and the financier who can rescue the failing family construction business. The child actress Harduin, with her earnest face staring out from under her helmet of bangs, resembles Huppert physically. They are also on a psychological spectrum: One's a psychopathic adolescent; the other a capitalist with ice-water in her veins. There is something theatrically contrived about placing the extended Laurent family all under one roof, a set-up you rarely see outside of television. And indeed, Happy End has something of the quality of a deranged sitcom. The family includes Thomas' second wife, Anais (Laura Verlinden) and a new baby, Paul (who, Eve, alarmingly, baby-sits). Also rooming at home is Anna's adult son, Pierre (Franz Rogowski), a depressive alcoholic and family scapegoat, who works in the construction business. There's also a suite for Anna's father, Georges (Jean-Louis Trintignant), whose wife died in the same way as Emmanuelle Riva's character in Amour. In a separate apartment, there are the Moroccan servants, Rachid and Jamila (Hassam Ghancy and Nabiha Akkari) and their young daughter, a victim of the Laurent's seldom seen ill-tempered dog. Haneke has explored dysfunctional bourgeois families before and he's conscious of repeating himself and of re-poking old wounds. Happy End could be seen as a sequel to Amour, in which Trintignant played another Georges who euthanized his wife. In a macabre running joke, he's determined to follow her in death, and tries to enlist everyone he meets to help him die - from refugees on the street to his barber. Finally, Georges focuses on Eve, rightfully reading her as someone who, like him, doesn't play by the rules. In a way, he encapsulates the general sense of mild disappointment I felt with Happy End: Disturbing films repel us but we can adjust and appreciate them with time. Obviousness leaves no room for growth. Happy End. Directed and written by Michael Haneke. Starring: Isabelle Huppert, Jean-Louis Trintignant, Mathieu Kassovitz, Fantine Harduin, Franz Rogowski, Laura Verlinden, Toby Jones. Happy End shows at the TIFF Bell Lightbox. Perhaps the most significant biographical detail about filmmaker Michael Haneke, the master director of Funny Games (1997) Caché (2005), The White Ribbon (2009) and Amour (2012), was that he was born in Austria in 1942. In the past 30 years, he has emerged as the political conscience of modern European cinema, exploring themes of atrocity, collective guilt, denial and surveillance. He describes his filmmaking as a form of questioning, and a challenge to the manipulative 'barrel down', model of American mainstream movies. I spoke to Haneke, a good-humoured gentleman with a professorial manner, at last September's Toronto International Film Festival, where we touched on a few ideas about his method. When you work, do you have any deliberate relationship to genre? You can see certain connections to your films -- historical drama, thriller, future dystopia, family film. Do you consciously think in terms of subverting genres? "Not at all. Of course I was aware that people would call Caché a thriller. But I wasn't trying to write a thriller. It seems every time you have a film with a crime and police involved, it's a thriller. Or Funny Games was a mixture of horror and thriller. It's not my concern. I'm only concerned with the best way to tell a story, the best form. Choosing the genre is the task of the critic or the audience. It truly doesn't interest me very much. Your films often have scenes of of technological-aided voyeurism and violence. Do you think there are ethical issues inherent in the biological urge to stare, or are they somehow fundamentally changed by the use of technology? Haneke: "I don't see staring or looking, as a problem. It's a human need. We're curious people and we want to see what's going on around us and we use any tool available to satisfy that curiosity. On the other hand, with the omnipresence of cameras, we have the impression we see everything, but in fact we see nothing. We see just surface. Let me ask about two scenes in Happy End, without dialogue. One is the magnificent long shot of the collapsing wall on a construction site. And the second is the long karaoke bar scene, with Pierre doing that crazy dancing, which is something you couldn't script. Haneke: The construction scene is a trick, a special effect. We told the construction works to look up and run, and another man in a crane to stop his machine and run over. The rest was CGI. When I wrote the karaoke scene, I hadn't cast the part yet and I just wrote that Pierre goes to a karaoke bar to make himself feel better but it fails. When I found the actor [Franz Rogowski], I discovered he couldn't carry a tune at all but he was very physically fit, so I came up with the idea that he should do this athletic performance, which also fails. The song he does [Australian singer-songwriter Sia's Chandelier] became a YouTube hit, which spawned all these parodies, which became its own sub-genre. And the girl in the video [American teen dancer, Maddie Ziegler) happens to look a lot like the girl in my film. So, in the film, Pierre does a parody of those parodies -- but all of these different layers are only available to the real specialists who will know what's going on in that scene." Some reviewers have assumed that the grandfather, Georges (Jean-Louis Trintignant) is the same character from your last film, Amour, because he has the same name and the same history of having smothered his ill wife. Would you characterize it as a sequel?" "I don't think so. In all my films the characters have the same names. By the way, I'm not the first: I'm always talking about the same people and my films are always set in the same social setting, because it's the only setting I know. It would be dumb if each time I were to invent new names for my characters."